Kenny Powers, Spokesman. Something we never thought we would ever hear, either in the fictional world of Eastbound & Down, or especially not on real-life commercials during ESPN’s Sportscenter. In what may have been one of the most daring and effective marketing campaigns ever, perennial basement dwelling shoe manufacturer K-Swiss just hit one out of the park. When one thinks athletic footwear, K-Swiss comes to mind somewhere in between Keds and Hush Puppy…that is, until Kenny Powers came into town. I would have paid good money to be in the room when executives at K-Swiss discussed who would be the face of their expensive new foray into the athletic shoe waters, which are dominated by juggernauts like Nike and Reebok. I think the guy (I assure you that it was a guy) that threw out the name, “Kenny Powers” deserves a medal. Can you imagine the reaction in the room by those suits when after assessing the competition that boasts a roster with the likes of Jordan, Kobe, Adrian Peterson, and Peyton Manning, some knucklehead throws out the name Kenny Powers? Well guess what, that knucklehead just singlehandedly made K-Swiss relevant. After getting past the initial shock of who Kenny Powers was, and seeing his utterly crass personality in Season 1 of EB&D, they set out on taking a chunk out of the big boys. Do you really think that if they signed on just another big name young athlete like Mark Sanchez or John Wall that any of us would have given a crap? The answer is no. Even though K-Swiss already has Jeremy Shockey, Patrick Willis, and some MMA dude (Urijah Faber) on board, they have played second fiddle to Mr. Powers in all the ads. 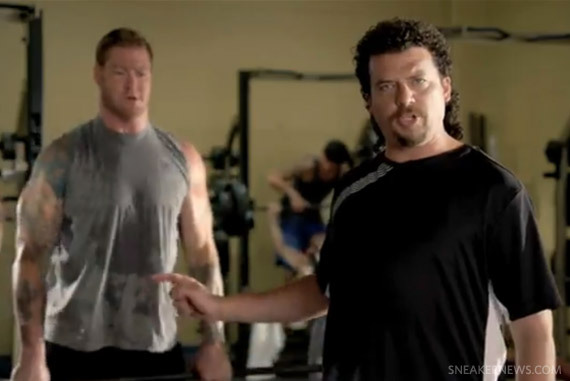 Kenny Powers is the first crossover TV character that I can think of to ever sponsor a sneaker. In one fell swoop, K-Swiss has mockingly denounced the humongous practice of signing athletes in the shoe biz. Let’s be realistic, he is a caricature of everything we have grown to hate about athletes today: he is self-centered, not so bright, more concerned about his image than his game, and the last person that should ever be an example for your kids. But he is so damn funny that you can’t help but love him. Some of the real stars of today (I’m looking at you Tiger and A-Rod) would actually benefit from taking his approach to fans, teams, and the media by using Powers’ approach and losing the fraud personalities that their PR reps have concocted for them. I have put some links to the ads (some are safe for work and some are not) so you can see what I am talking about first-hand. I never thought I would ever consider actually buying a pair of K-Swiss sneakers, but if there is one person who could make me consider it, Kenny Powers is that guy. Big props to K-Swiss and Kenny. And make sure your calendar has September 26th marked off….Eastbound & Down Season 2 premiers on HBO. Check out K-Powers new commercial as the MFCEO of K-Swiss! !